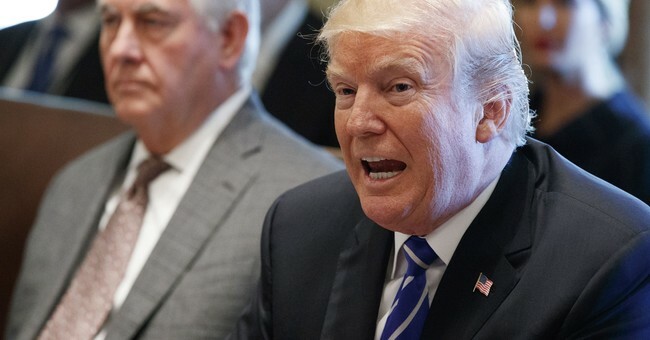 In a cabinet meeting Monday, President Trump announced that the U.S. is placing North Korea back on the list of state sponsors of terrorism. The designation will place "further sanctions and penalties" on the Kim Jong-un regime. With his announcement, Trump reverses a 2008 decision by President George W. Bush to remove North Korea from the list. Under Kim Jong-un, North Korea has been more aggressive in its ballistic missile testing, despite repeated threats from the U.S. At the United Nations General Assembly in September, President Trump referred to the North Korean dictator as "rocket man" and warned him that if the U.S. is forced to defend itself or its allies, they will have no choice but to "totally destroy North Korea." "Rocket man is on a suicide mission for himself and for his regime," Trump said. "The United States is ready, willing and able, but hopefully this will not be necessary." Following his 12-day trip through Asia earlier this month, the president declared that one of his goals was to unite the world against the North Korean threat, which he said required "urgent action." House Foreign Affairs Committee Chairman Ed Royce (R-CA) applauded Trump's announcement in a new statement, outlining a host of other egregious actions taken by North Korea in recent months.